Work, work, work, no play....almost! Currently I balance my responsibilities at the studio with a full-time job as a tax CPA at RSM US LLP. Thankfully everything is in Charlestown and I'm a good multi-tasker. I am really excited for the holiday season, my favorite time of year, and want to focus on having fun and healthy community events at the studio to recognize our loyal clients, promote other local businesses and charities, and overall have a little bit of fun in betweem the craziness that this time of year brings! Slip-on sneakers anyone? These look great to and from the gym with tights or crops and also look cute and sporty with skinny jeans. Slip-on is key when you're always on the go and the prints, fabrics, and options are endless so hoping to build up my collection this fall. Also very excited to wear plaid scarfs and cute knit hats with the big fur pompoms as the weather gets colder! They look adorable on everyone! HOW DID YOU BECOME A SPIN INSTRUCTOR AND WHAT WAS YOUR INSPIRATION FOR OPENING YOUR OWN SPIN STUDIO? I started spinning in college almost 10 years ago. It was the first time I was really exposed to it. I loved the intensity and the high energy of the classes and continued being a student until 2012 when I finally got certified. My best friend at the time was an instructor at another boutique studio in Boston and after going there for a couple of years I realized it was something I thought I could be good at. It's an amazing feeling to be able to coach others and see the work that your students put into every class. That satisfaction motivated me to open here in Charlestown, a neighborhood I have known since 2006, and bring more health and fitness options to this growing neighborhood. 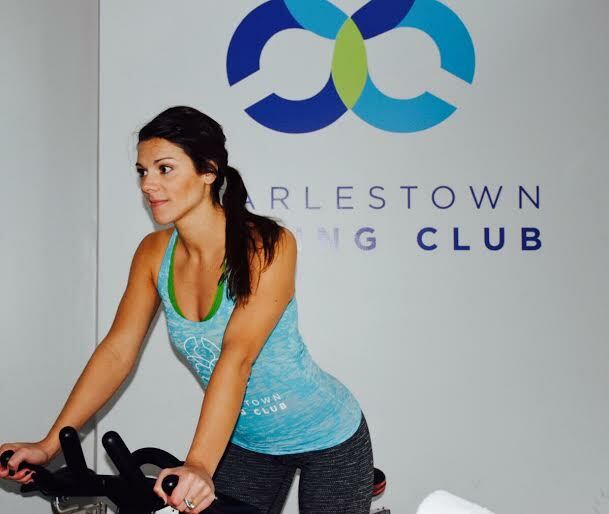 I am an entrepreneur at heart and never thought I'd get to live my passion for fitness everyday, but CCC and the awesome Charlestown community has made that possible! WHAT ADVICE DO YOU GIVE TO SOMEONE NEW SPINNING AND NEW TO YOUR STUDIO? Go. At. Your. Own. Pace. Spinning has such a stigma for being hard, intense, and advanced, but the best part about it really is that is completely accommodating to ALL fitness levels. Everyone should definitely try it at least once and see if it's for them. Whether you shed 100 calories in class or 1,000, we are here not just for the burn but also for the community.